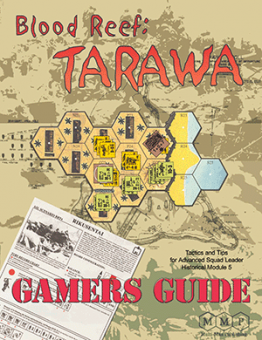 This magazine is a series of articles by respected hobbyists on how to play and enjoy the ASL Historical module Blood Reef: Tarawa (BRT). It pulls together the esoteric bits and pieces of Chapters E, F, and G that are needed, shows how they interact with the BRT-specific rules of Chapter T, and provides a programmed instruction approach for players to learn the necessary rules by playing individual BRT scenarios in a specified order with only part of the rules required in each case. Other pieces explain the nuances of particularly complex rules (such as Breaching Seawalls and Bombardments) and provide several illustrated examples of play. Individual strategy sections are provided for the Japanese and Marines, to understand the specific challenges for each side and the options for dealing with them. There is a playing of CG III from the Marine playerís point of view, and a brief summary and chronology of the historical battle. Printed on glossy stock; 68 pages.